Now you can learn the same PR strategies and tactics we’ve used to help hundreds of professional services companies rapidly grow their client base and increase revenues. 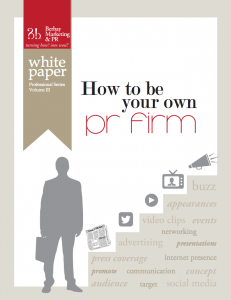 How to be your own PR Firm is a free whitepaper that takes you step-by-step from the initial planning stages to becoming a trusted industry resource for business media and influencers. In this helpful guide, we’ll share some of the “tricks of the PR trade” that we use for our clients to turn them into credible sources that the media will call first, whenever they need an expert opinion. And as you know, credible experts get more customers, charge higher rates and grow their revenues. Convert your newfound visibility and credibility into customers and revenue. Complete this form for access to our PR Strategy Whitepaper.